The actual infinite arises in three contexts: first when it is realized in the most complete form, in a fully independent otherworldly being, in Deo, where I call it the Absolute Infinite or simply Absolute; second when it occurs in the contingent, created world; third when the mind grasps it in abstracto as a mathematical magnitude, number or order type. 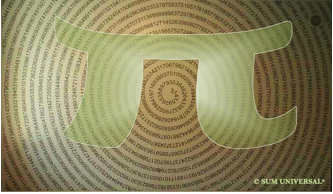 Number Pi is a mathematical constant, which is present in many mathematical formulae, including circles, ellipses, and spheres. It is an irrational number, which cannot be represented as an exact fraction of a whole, and it has infinite digits with no apparent repeating pattern. The trinity and Oneness of God and our Oneness with God is actually reflected through number Pi (3.141592....). Number three combines the 3 basic properties: consciousness, subconsciousness and super-consciousness (also seen through the atom: proton, neutron, and electron) of the Higher Power, and every number following the period is part of the whole of number Pi. As I have already mentioned in my book, number Pi hints at something very important. We are all the product of 1 and 2 make 3, whereas number Pi starts with number 3. The digits after number 3 are important and these digits start with number 1, 4 and so on. 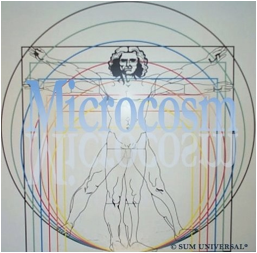 Looking at the microcosmic man picture, we notice that the man has 4 extremities and 1 head. The human form a product of 1(male) + 2(female) = 3(child) has 1 head (intellect/mind), which creates and/or invents, and 4 extremities which construct or do. And this is actually represented by number Pi, starting with the numbers 3.14. Furthermore, our interactions are based on duality and that includes that 2 states interact with each other; our actions are expressed through 2 states like the digital coding system (1 and 0). The meaning of double-digit number 14 actually means that number 4 works through the number 1 and will manifest in number 5 (1+4=5). Through the actions of number 4 (construction, matter, stability) and number 1 (active, dominant, independent) the objectives of number 5 (change, endurance, freedom) will be manifested.